Celebrate Repeal Day with Mint Julep Experiences by booking your next distillery tour at a discount! For one day only (Wednesday, Dec. 5), we’re offering $19.33 off each public bourbon or whiskey tour ticket. Use promo code REPEALDAY at checkout to redeem this special offer. Discount may be applied to any Louisville public bourbon tour or Nashville public whiskey tour between Dec. 6, 2018 and March 31, 2019. Shop our website for distillery tour availability, itineraries and pricing. Tickets must be purchased Dec. 5 for promo code to apply. Tours must be completed by March 31, 2019. Discount cannot be applied to previously purchased tours. Enter discount code REPEALDAY in the “Have a code?” section in online checkout or call 502-583-1433 (Louisville tours) or 615-436-0187 (Nashville tours) to book by phone. Repeal Day celebrates the passage of the 21st Amendment to the United States Constitution. In 1919, the 18th Amendment enabled a national prohibition banning the production, distribution and sale of alcoholic beverages. On Dec. 5, 1933, the 18th Amendment was ratified, making alcohol legal again. Some distilleries were able to produce bourbon, whiskey and other spirits during Prohibition for medical reasons. Learn more on your next Mint Julep tour! Prohibition is a popular topic on any of our experiences. Be sure to ask your guide to tell you more. Gather your friends and family and plan a trip with Mint Julep Experiences this winter! Choose from any of the following Mint Julep tours between Dec. 6, 2018 and March 31, 2019. All Louisville bourbon tours depart from the Mint Julep Gift Shop on the third floor of the Galt House Hotel. Each tour includes a tour and tasting at two distilleries and a special tasting-only stop at a third distillery. Your expert guide will fill your day with fun facts and bourbon knowledge. A Southern-inspired lunch at a local restaurant and bottled water are also included. Maker’s Mark, Jim Beam, Heaven Hill – Departs at 8:00 a.m. and returns at 5:30 p.m. with full tour and tasting at Maker’s Mark and Jim Beam and a tasting-only stop at Heaven Hill Bourbon Heritage Center. Woodford Reserve, Buffalo Trace, Four Roses – Departs at 8:00 a.m. and returns at 5:45 p.m. with full tour and tasting at Woodford Reserve and Buffalo Trace and a tasting-only stop at Four Roses. Maker’s Mark, Lux Row, Barton 1792 – Departs at 9:15 a.m. and returns at 6:00 p.m. with full tour and tasting at Maker’s Mark and Lux Row and a tasting-only stop at Barton 1792. Maker’s Mark, Jim Beam, Barton 1792 – Departs at 8:00 a.m. and returns at 5:30 p.m. with full tour and tasting at Maker’s Mark and Jim Beam and a tasting-only stop at Barton 1792. Maker’s Mark, Lux Row – Departs at 9:30 a.m. and returns at 5:30 p.m. with full tour and tasting at Maker’s Mark and Lux Row. Only available Sundays March through October. All Nashville whiskey tours depart from the Omni Nashville Hotel near Bongo Java coffee shop. All admissions and tastings are included in your tour. An expert guide will take you from destination to destination for a fun-filled day in Tennessee! Bottled water is included. Some tours include additional food and beverages, see descriptions for details. 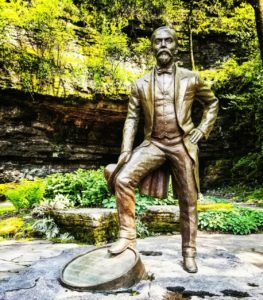 Jack Daniel’s, George Dickel – Departs at 9:00 a.m. and returns at 6:30 p.m. with full tour and tasting at Jack Daniel and Cascade Hollow (the home of George Dickel brands). Available Wednesday, Thursday, Friday and Saturday. Includes lunch. Edley’s Bar-B-Que, Bearded Iris Brewing, Nelson’s Green Brier – Departs at 11:45 a.m. (lunch) or 5:15 p.m. (dinner) and returns at 4:00 p.m. or 9:30 p.m. with full tour and tasting at Nelson’s Green Brier Distillery, pint of craft beer and taproom visit at Bearded Iris, and BBQ and Tennessee whiskey sampling flight with Southern sides at Edley’s. Jack Daniel’s, Lynchburg Town Square – Departs at 9:00 a.m. and returns at 3:00 p.m. with full “Angel’s Share” tour and tasting at Jack Daniel Distillery and time for shopping, sightseeing and food in Lynchburg. Lunch not included.